It is said that it often takes the Swiss longer to implement innovations than any other nation. For many years Zurich has planned to install a public bicycle rental system in the city such as can be found in many other prominent European cities. With automated pickup and drop off stations the system was near to running but a wave of public feedback on the issue has meant the system has somewhat stalled. As with bicycle rental so it would seem is the case with a new football stadium in the city. 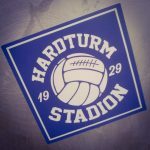 The new Hardturm Stadion is a football-only venue that is planned for the site of the old stadium. 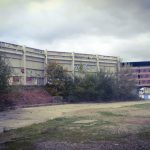 Once host to Champions League football and a FIFA World Cup semi-final in 1954 the stadium was closed in 2007 and subsequently demolished in 2008. 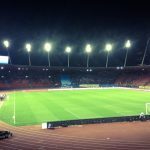 With the old stadia a rundown shell plans for a new stadium were made with the expectation Switzerland would be chosen as a host for the 2008 European Championships. In 2003 official plans were presented for a new 30,000-seater that would be able to host group matches at the UEFA event. However, resistance from local residents especially with respect to potential traffic issues and the shadows cast from any new build stadia led to a number of delays and the plans being rejected. 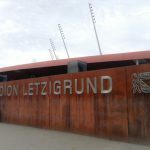 Instead, it was decided by the city to renovate the Letzigrund stadium for the tournament. In 2009, Credit Suisse, who owned the prestigious land on which the Hardturm sat, stepped out of the project and sold the site to the city of Zurich. New plans were made for a smaller stadium with 16,000 seats in combination with a shopping centre and hotel, but the plans were again voted down in a referendum in 2013. 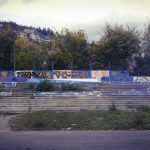 The site, which sits in close proximity to the Swiss Financial Museum (Schweizer Finanzmuseum) was opened up to new bidders in 2015 and the city announced a competition for investors to come up with the best project for the land. 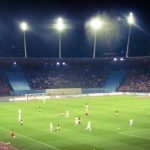 In the summer of 2016, a winner was announced and plans for a new stadium with a capacity of 18,500 have been exhibited. This, however, will not be the end of the matter. The winning project team are attempting to develop the project but again a popular vote from locals on the issue will take place. This means that there is no firm timeline as to when a new stadium is expected to be ready or whether the new plans will be accepted at all. In tandem to this surrounds the delicate issue of stadium ‘ownership’. 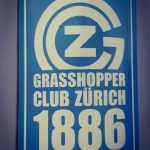 The Hardturm was the traditional home ground of Grasshoppers Club Zurich but if the concept is given the go-ahead any new Zurich Stadium will be shared by both clubs – Grasshoppers and city rivals FC Zurich. 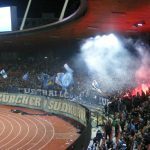 When the Letzigrund was being redeveloped for Euro 2008 both Zurich clubs shared the Hardturm stadium and this move proved unpopular with fans. 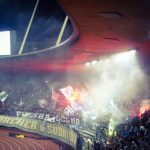 With a compact layout and a small capacity, the new stadium in the Hardturm area of Zurich is to be a football-only venue. Sitting next to the Hardturm tram terminus it will have around 175 housing units with the current forecast being this will all be ready for 2022. The issue of whether the project gets the go-ahead seems in the past to have centred around that of local municipal public spend. 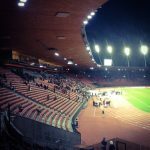 Many locals perceive that the current existence of the Letzigrund in Zurich means there is no need for another sports venue. However, with the new stadium earmarked to be built privately by a joint financial and private bidder (Credit Suisse and HRS) at a cost of 500 million CF, there is hope that the new ‘Ensemble’ Project will not generate similar opposition among the nearby residential communities. The ‘Ensemble’ project includes the building, financing as well as the operation of a football stadium for 18,500 spectators. Two 137-meter residential and commercial towers alongside the stadium are also part of the plans. These strategically positioned towers will contain 173 community housing apartments offering rented housing in a city that already has huge affordable housing and office space problems. With a Saturday evening kick-off, local rivalries and fierce anticipation build early in the city. 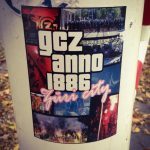 At the former Hardturm Stadium, the fans of GCZ begin to congregate on the broken terracing from 4 pm. 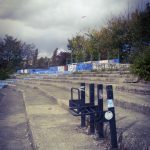 The site resembles a rundown carpark but specific areas of the former stadium still exist including part of the stadium wall and one area of terracing. This makes the site ideal as a meeting point for supporters in the lead up to a match. 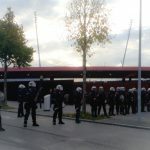 Despite being relatively isolated in a cordoned off area of the former stadium, at around 4.30pm a large group of masked FC Zurich fans arrive off the tram and challenge the riot police to a fight. Chants are also directed to those Grasshoppers fans who are inside. 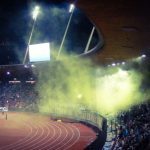 Tear gas is fired at the FCZ groups and they are quickly dispersed back towards the city centre but it’s already a warning that this a powderkeg high-risk fixture prone to outbreaks of supporter violence. 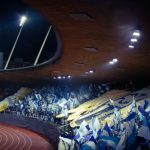 By 5.30pm all the huge tifo display flags have been prepared by the away GCZ club and the rallying call to march onwards to the Letzigrund can be heard. Around 600 fans embark on the 30-minute walk to the stadium through side streets and via an underpass led by a line of riot police and watched by an overhead police helicopter. Despite the security personnel on display, the walk is characterised by aggressive chanting as well as hundreds of smoke bombs and pyrotechnic devices being lit and thrown. 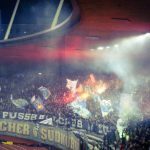 Outside the Letzigrund, a much larger Corteo procession of FC Zurich supporters has also met its endpoint and the chanting across police lines commences once again between rival supporters. Originally opened in 1925 the Letizgrund venue is better known for its role in hosting the athletes of the Weltklasse Zürich. Like the Hardturm the stadium has also witnessed courtroom arguments and dispute. The city powers and construction companies have been involved in a dispute with respect to the 2007 upgrade and the cost of subsequent structural alterations. 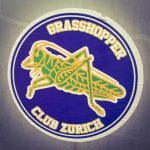 Off the field meanwhile, there is the parallel issue of ground ownership and the perceptions by fans of Grasshoppers and FC Zurich as to whom ‘owns’ the stadium. 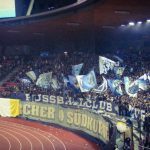 While the stadium was originally owned by FC Zürich, ownership now is the hands of the city of Zurich which has invested in various modifications in almost every decade since 30’s. Today, however, the question seems to be around which club owns ‘derby day’. The answer to that comes on the field of play with Grasshoppers sweeping aside a poor looking FC Zurich team. GCZ take an early lead through the Dane Lucas Andersen and they could have added a few more before the half-time whistle such was the dominance of the visitors. At the resumption of the second period, a second goal is added by the Kosovan Bajrami before a penalty by Djuricin. 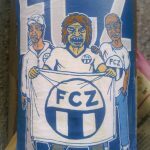 By now it is a procession and becoming all too much for many FC Zurich fans in attendance. 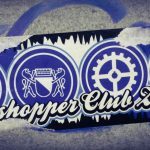 Eventually, the scoring is completed by the teenager Zesiger making it 4-0 to a powerful and fluent looking Grasshoppers team. 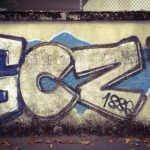 There are countless things to do on a crisp autumn day in Zurich. This is a city that has numerous areas of green interest through which to explore the city fall foliage in all its yellow and orange glory. Such is the cleanliness of its surroundings it’s difficult to think of many better places than a peaceful stroll along the lakeside between Bellevue and Zurichhorn. 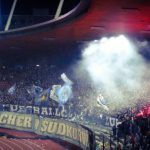 The Zurich football derby, in contrast, is not a match filled with many of the middle-class pleasantries we have to expect in this upmarket city. Rather than being littered with the sold-out intensity we see in many other European inner city derby games it is a passionate event full of spectacular colour and noise but the empty seats would indicate a city that is far from in love with its football teams. Still, both sets of loyal local fans in attendance contributed greatly to one of the few city derbies that exist in this part of the world. Sadly for FCZ, it was the visitors in black and yellow who came out on top in what turned out to be a very one-sided affair.